Christmas shopping can be expensive and time-consuming. Wouldn't it be great if you could take advantage of that time to make some extra money? Fortunately, we found a few ways for you to earn extra cash for the holidays while you do your Christmas shopping. If your vehicle is in good condition, you may want to consider signing up with one of the ride-share services. With services like Uber and Lyft, you can choose which rides you want to provide, at a time most convenient for your schedule. So, for instance, you can pick up riders when you have some extra time, who happen to be going in the same direction as your favorite holiday shops. You can even charge for carpool services to take your neighbors with you on your next shopping trip. 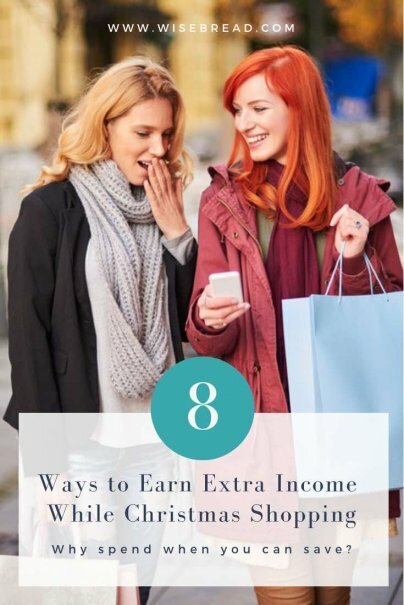 They can avoid taking their car, you'll get gas money, and you can even shop together to make the experience more enjoyable. Getting paid to run errands can be fun, rewarding, and a quick way to earn money on your own time, on your own schedule. Typically, these gigs include shopping for groceries, delivering food, driving people around, and a myriad tasks that may be suited more to your specialties or interests. You can deliver items and run errands with sites like Postmates, Instacart, Amazon Flex, Door Dash, TaskRabbit, Fiverr, and many more. During the holidays, it can be especially lucrative to run errands for people when they are too busy with holiday plans to do things like gift buying, shopping for decorations, and mailing out packages at the post office. If you actually enjoy holiday shopping, you can even make money personal shopping for people who just don't have the time or desire to do it themselves. All you'll have to do is complete their holiday shopping while you complete your own, so it won't take much time out of your day and you can earn a decent amount around the holidays. Typically, you can charge by the hour or by the trip. You can also sign up with a company like Care.com to run errands for seniors, with an average rate of $13.50/hr. Completing online surveys while you stand in line will help you earn a little cash and will make the time fly by. Sites like Opinion Outpost, ProOpinion, and Nielsen Homescan will pay you for each online service you complete, so you can complete them on your own time. You can also be selective about which surveys you fill out, only completing the most lucrative ones. If you have a talent, such as painting, jewelry making, knitting, or crafting, consider gifting some of your work to your friends and family. It will cut down on who you need to shop for, cost you less, and will mean more to the recipient. Better yet, consider making extra crafts to sell on eBay or Etsy so you can also make some extra money from your craft. Sites like Fotolia, Shutterstock, and SmugMug will buy your original photos. Consider taking photos of your area while you Christmas shop to sell online. This can be particularly lucrative if you live in a large city or popular destination. Just take a camera with you during your Christmas shopping and you can sell the photos later when you get home. Believe it or not, you can actually get paid to lose weight. Sites like DietBet, Pact, and HealthyWage will allow you to set weight loss goals for yourself. If you meet those goals, or complete weight loss challenges and contests, in a specified amount of time, you will receive money. Not only will this help you make a little money while you're running around doing your Christmas shopping, but it can also provide another incentive not to gain an excess amount of holiday weight. Achievement offers a similar type of payout program for completing healthy activities, which won't require any additional investment of time or energy during the holiday shopping season. Many people actually burn calories during their holiday shopping, but then gain it back during their holiday eating. It doesn't take much more effort to burn more calories while you're out and about, so this is an easy way to make a little bit of extra money on the side. The only downside to this is in order to take part in these challenges, you will need to contribute a small amount of money yourself. If you do not complete the challenge or meet your goals, the money you invested will be split among the winners.